A popular Indian smartphone vendor Intex will soon launch a new budget android phone in the market, the Cloud Z6. 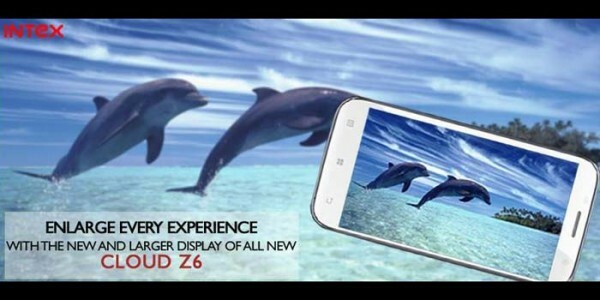 The Intex Z6 will have 5 inch (854x480p) FWVGA resolution capacitive touch screen display. The company has not disclosed the full specifications of the phone yet. It would be the improved version of Cloud Z5 which has a 5inch display, 1.0GHz dual core CPU and 521MB of RAM. The Cloud Z6 would be powered by 1.3GHz dual core processor paired with Mali 400MP GPU. The Company has recently launched Intex Aqua i6, which is the Asia’s first 1.3GHz quad core MT6582 powered smartphone. The Cloud-Z6 will feature Dual SIM, 3G, WiFi, Bluetooth and GPS. The phone will have three touch sensitive buttons at the back. The camera would be of either 5MP or of 8MP resolution. As company has not officially announced the specs so take the above specs as rumor. Stay tune we will update is something new comes out on the same.